20 Wedding dance songs from Bollywood which will make your guests groove the night away! 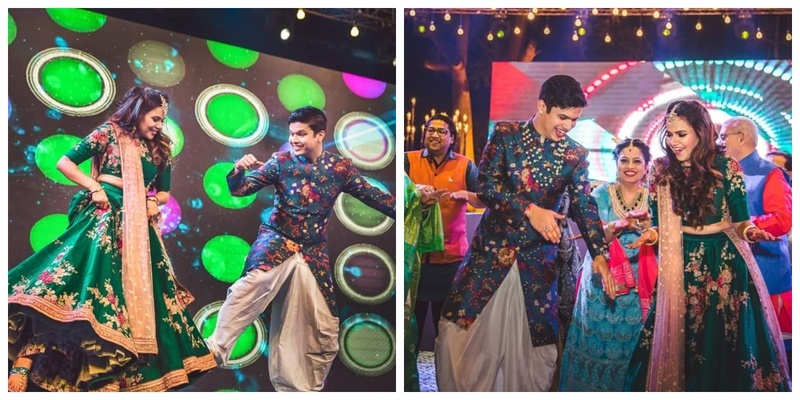 Wedding dance songs are the life and blood of every desi wedding. Right from haldi and mehndi to sangeet and cocktail party, there is enough naach gaana in an Indian wedding to put a Rajashri movie to shame! This wedding dance songs list right here is the ultimate playlist you need to choreograph your dances for all the pre-wedding events. The latest wedding dance song of 2018 is sure to set several sangeet stages on fire! Check out the steps of this one and be all set to groove on this spin off on the 90s hit! Tareefan is legit the the girl gang wedding dance song of 2018! If you are planning to choreograph a ‘girls only’ dance for the bride, please pick this chartbuster and wait while others join you to shake a leg! The less said about this wedding dance song, the better. I can bet if you play this song at the cocktail party, you will find everyone including the bacchas and the fufas putting their best foot forward on Bom Diggy Diggy! The upbeat music and catchy lyrics of this wedding dance song are sure to persuade even the most unmotivated dancers to get on the floor. Well, let's just say Chogada was the Gujju garba anthem of 2018. If you have attended Navratri anytime this year, you will know how the crowd has gone crazy when this wedding dance song has blasted on the speakers! Play this wedding dance song after the public is a few pegs down and watch the crowd go mad! Looking for a fun wedding dance song for the couple? Pallo Latke is your answer. 2018 has sure been the year of terrific garba-themed wedding dance songs. If Chogada hasn’t quenched your thirst for showing off your killer garba moves, Kamariya will definitely come to the rescue. “Gaana toh bahana hai, shadi me bass nachna hai.” If you believe this to be true and just need a fun wedding dance song to move your kamariya, then Morni Banke is a fantastic pick! Yet another 90s wedding dance song remix, Chalti Hai kya 9 Se 12 is for all the ‘taporis at heart’ to dance on. This all-time favourite wedding dance song from Badrinath Ki Dulhania is sure to get the entire fam grooving to its beats. Remember the catchy Hawa Hawa from the 90s? This is the remixed rendition of that gem. Pull up your socks, cos this wedding dance song is going to be one hell of a sweat ride! A hatke wedding dance song, Bandook Meri Laila is sure to get the young crowd of cousins and friends on the dance floor. A quirky yet peppy wedding dance song, Udd Gaye by Ritviz is sure to see some chahchas and fufas dancing with a whiskey glass on their head. When there are ‘daru ki nadiya’ flowing on the cocktail night, you possible cannot skip playing this wedding dance song! Full points for whoever matches the charm of Rajkumar Rao while grooving to this wedding dance song! This wedding dance song is the trademark boy gang song, where they all go berserk trying their best to imitate Ranveer Singh! Yet another wedding dance song for the groom and his boys to dance on! Let us know if you want us to make another list of Hindi wedding dance songs that were popular in 2018!